In such a critical period for world yachting, we have seen during this year that the big yacht sector (and its allied industries) has not suffered from the ups and downs of the market and has always remained on the crest of the wave. The sector does not feel crises, in fact after the gloomy periods of recent years it has managed to keep its head high, thanks also to national and international shipyards that with innovation, will and determination have managed to survive and grow, looking to a rosy and prosperous future. It seems that megayachting doesn’t follow the vicissitudes of today’s market, and the desire for recreation and pleasure cruising is always there among yachtsmen and elsewhere. Research carried out by ISPO (the Italian Institute for Public opinion studies) on a large sample of yachtsmen showed that 42% of interviewees associated the yacht with the idea of freedom, 35% with the idea of adventure and the remaining 23% with passion. In short, the majority, about 67% of interviewees, associates voyages with recreation and fun. Only 33% considers it an extension of their ego or a luxury to boast about and show off. Certainly fashion is always an interesting and necessary component, which keeps the market alive even in these less than happy period; but yachting is not only this. This sector has a lot to give in terms of associated industries and jobs and just as much in terms of direct and indirect economic benefits. In recent years we can say that Italian yachting has come into line with countries that in the past were considered more evolved from this point of view: France, England and the United States, to name only some. In the United States too there has been a similar policy leading to complete recovery and protection of yachting tourism. Representatives of the National Boating Congress organise a kind of national yachting festival every year on 1 July. In America the yachting sector is worth $2.8 billion, without considering allied industries, and employs 30,000 people. In Florida alone there are more than 34,000 yachts registered. Yachting generates a lot of turnover. So yachting is not just limited to diversion, buds breads over several cultures and a sector of luxury and well-being can bring economic benefits to society as a whole, favouring market dynamics and creating jobs. The Italian yachting industry is a production sector of excellence, recognised and appreciated abroad. Large, medium and small companies are an important and exemplary microcosm of a large network, appreciated outside Italy’s borders. The project for a yacht may be aimed at mass production or the production of a semicustom or custom yacht. In the megayacht sector, semicustom and custom yachts are the most widespread as they give the owner the chance to make them respond more closely to his needs and ideas, a fundamental aspect very yacht. A custom yacht is built by the yard to specifications indicated by the designer and his client. In recent years the number of these seagoing giants has grown, making it possible for the owner to have fully customised design of the interiors, obviously with the help of his designer. These are increasingly large and comfortable yachts, exclusive residences, status symbols, places to entertain and socialise rather than just means of transport. Compared to the 1980s and 90s, yacht users have changed in character, diversifying and broadening considerably. The yachting product, from conception to construction, has seen in the past 30 years a decided implementation of the project spiral which, from a strictly craft construction tradition, has led it towards increasingly complex industrial methods depending on recent construction technologies, the development of engineering and diktats from the world of design. Yachts today are built with unprecedented complexity compared with the past and are designed with a raft of details and endless sources of comfort unknown to the more classical yachting tradition of the past. Contemporary professional figures, engineers, architects and designers, who have made a profession of their passion for sailing, are called upon to operate in an increasingly complex sector that demands a high degree of specialisation. The idea of luxury has always been closely linked to the stereotypes and classic iconography of the world of yachting, the luxury yachting market has evolved considerably towards the end of the 20th century and has developed in recent years. All this goes against the trend of other sectors of the economy, taking it into a leading role in the yachting sector compared with other types of yacht, demonstrating excellent prospects for further growth despite the crisis in 2008. The growing phenomenon of chartering has helped this expansion, allowing and encouraging many owners to profit from their yachts, thus bringing new figures into the world of yachting. If a number of people feel they can “hire” a dream yacht, without the expense of owning one, this is certainly good for the market which enjoys remarkable turnover. Charter management by companies has increased the spread of this phenomenon, without making the cost of the superyacht weigh upon a single owner. In this analysis the luxury yacht sector is one based on the search for a contemporary conception of experiencing voyages, roominess and luxury furnishing. Contrary to what one might think, luxury is no longer linked to kitsch, exasperated and baroque furnishings; luxury today has become a synonym of the modern, elegant and original. As Coco Chanel said: “luxury is the opposite of vulgarity”. If cruise ships are floating cities, mega yachts are floating villas. Italy is today one of the world’s largest producers of superyachts (to give them this generic name) and its current success shows it. This sector is one of the most important luxury markets; it is not easy to compare it with other sectors; its exclusiveness certainly comes from a very particular customised product, customised in every detail by the owner or the owning company, and so exclusive and expensive to buy. The psychological component of the yacht means it is also constructed as a symbol of the economic success of the owner and by association a guest on board also benefits from it. In the third millennium we have seen an acceleration in the growth of the size of superyachts, also as a response to the increase in European customers and the newly rich Russians, Asians and Arabs. The yacht is considered like a company by the owner or shipowner, while the customer considers it a toy. It has to be underlined that it is a means of transport with running costs of more than 1 million Euro! 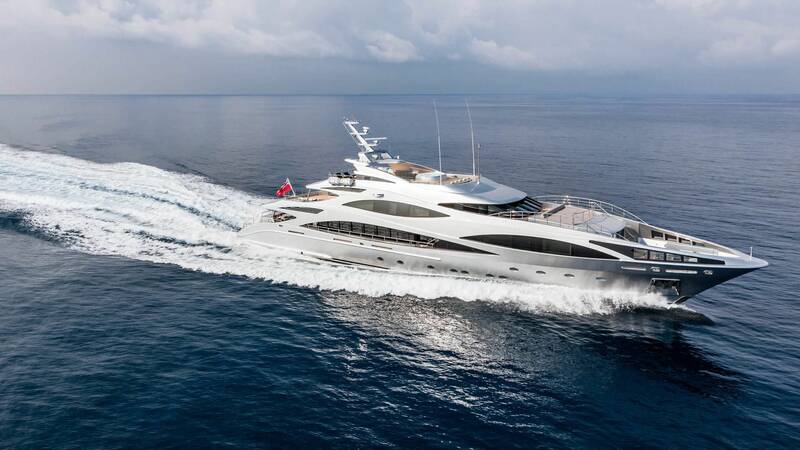 With the logic of charters, it is worthwhile for everyone, both the owner or the agency and the customer; the offer of big yachts has increased considerably and the market has seen great development. Its attraction finds confirmation with the entry of new international and national players, some of which are already operating in the luxury goods sector: Bulgari, Ferragamo, Dredner Kleinwort Capita, Cavalli, Dolce & Gabbana, Swarovsky, Armani etc. Right after the American banking collapse, the strategic consultancy Bain & Company carried out a piece of research entitled “Super luxury yachting won’t feel the crisis”, published in Yacht Capital (n°12, December 2008). This study forecast that the luxury goods sector, which grew throughout 2008, would have slowed down 5% in 2009. The companies that suffered from the crisis would have been those operating in the accessible luxury sector (furnishing, design, clothing etc. ), which is what actually happened, though a little less tragically than expected. The research said the only safe sector was luxury yachting, predicting growth of 8% in 2008 and 9% in 2009. This thanks to increasing sales of superyachts above all in emerging countries. Some years after the research, we can say that the crisis hit all sectors and in fact the forecasts of Bain & Company have proved accurate. In fact, although yachting was hit hard by the crisis, in the upper echelons its impact was less devastating. First of all because building these floating villas take several years. And so, except for a few cancelled orders, yachts under construction kept many yards busy until 2012 when the worst part of the crisis had passed. In addition these giants of the sea occupy many specialised people for moorings, maintenance, bureaucracy and everything that rotates around megayachts. If we just look at Italy we can see how big the fleet is with well over 95,000 vessels registered with the Maritime offices, including about 300 yachts of more than 24 m, superyachts (data supplied by the National nautical observatory with the patronage of the Ministry of tourism and UCINA). Trends in the world yachting industry in recent years, and above all in Italy, confirm the increasingly growing production of yachts of more than 24 m. The many people interested in yachting tourism are thus satisfied by a particular kind of tourism: chartering, a way of enjoying all the comforts of the yacht without owning it. The charter market is growing. But more than just numbers, more than the number of companies and agents offering holidays on board, this growth concerns above all the materiality operators in the sector have reached today. Chartering exists for boats of all sizes, but obviously for superyachts it is the most usual and most used method. Charter yachts run by management companies may be the property of the owner, who sets up a company when he purchases the boat, or of third parties. Very large shipbuilders have entered this business by purchasing well-known brokerage companies. And yachting tourism is extraordinarily important in the global tourist economy. In fact the perennially high demand for this kind of tourism brings money to the host countries: the social status of the travellers on these yachts guarantees a medium/high level of tourism that brings value to the destinations they visit. Every stopover of the yacht means money spent in restaurants, shopping, in other forms of transport, in cultural attractions in the cities and spending for other services. It’s true the yacht is a place of relaxation and enjoyment for the passengers, but it is part of a voyage that certainly includes stages and excursions on dry land. The luxury charter sector has a logic all of its own and is based above all on the quality of the yachts and services offered. On board the only activity “allowed” is relaxation and the only “worry” is to make a wish and have it come true. The crew is fundamental in offering complete, high quality service. More numerous and skilled the crew, the higher the standard of service. The voyage on board thus takes on new and unexpected dimensions: no longer space and time of waiting for the next stopover, but an experience of entertainment, comfort, diversion, relaxation and security. The yacht is transformed into a spa: it offers the cuisine of a gourmet restaurant, becomes a caddy for the lovers of the green, an art gallery or a base for those who like diving, exploring archaeological sites near to the anchorage or simply relaxing on the yacht’s sunbed. It becomes holiday with a high standard of service and a boat that becomes a resort. This kind of luxury charter is also called a “floating hotel”, a floating hotel chain with various destinations throughout the Mediterranean. Dominant are super, mega and giga motor yachts, while sailing yachts remain a particular niche, attractive only to create enthusiasts. 70% of those who purchase these superyachts chartered only for a limited time, which may range from a few months to a few years, to pay the running costs. And so the megayacht market is also strategically important for tourism on the Italian coasts and not only there. There are interesting data in research that the Risposte Turismo agency carried out on the megayacht sector. It found that the economy linked to these yachts can have positive effects and bring development all over the country and internationally. Let’s draw some conclusions on the years 2017-2018, a report on the sector of megayachts over 50 m.